News in Youth Services: Wondering What to do Over Spring Break? Wondering What to do Over Spring Break? Hurray, it's Spring Break!!! I love this time of year. The days stay lighter longer, the temperatures creep up and families come and visit the library. We have some fun activities for you during the time off from school. 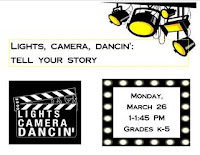 On Monday, March 26, the library welcomes dancers from Lights, Camera, Dancin'. Watch the performance starting at 1 p.m. and then grab your dancing shoes as the dancers teach you some new moves. Imagine how amazing you will look on the dance floor at the next family wedding you attend. Please register for this program as space is limited. Do you like to draw? Children ages 7-12 can spend some time learning from artist Christine Thornton. The Zentangle Method is an easy-to-learn and fun way to create beautiful images by drawing patterns. The patterns are called tangles. Tangles are created with combinations of dots, lines, simple curves, S-curves and orbs. Zentagle art is unplanned so you can focus on each stroke and not worry about the results. 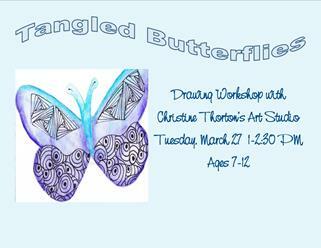 Come join in the fun on Tuesday, March 27 from 1-2:30 p.m. Participants must register. Please call to reserve a seat or register online. If you loved it during the summer, then you are sure to enjoy our springtime session of Grandparents Got Game (GGG). 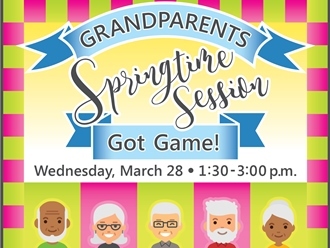 Grandparents or grand-friends can drop by anytime with their grandchildren on Wednesday, March 28, starting at 1:30 p.m. until 3 p.m. Join us for a special craft, fun activities, a snack and board games to play. What a wonderful way to make special memories! 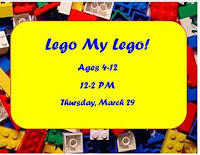 And finally, on Thursday, March 29th from 12-2 p.m., come in and build your very own Lego creations! Bring a friend or two and hang out in our storytime room to create with LOTS and LOTS of Legos. Then give your project a name and it will be displayed in the Youth Services department for all to admire. People love looking at them. Don't forget that we offer Museum Adventure Passes to local museums as well as the Brookfield Zoo. The number of passes is limited and you must be present to check out a pass. Limit one per family. We hope to see you at the library over the break. Even if you are hitting the road, stop by and grab a few audio books or DVDs for the long car ride. You won't be sorry.